Saturday night we spent in Texana Park and Campground arriving after hours. The GPS took us a mile past the park entrance. We stopped and called the park and the Law Officer came out and escorted us right to our campsite. That was great service. Sunday we drove to friends (clients in another era) that have a beautiful home overlooking Nueces Bay and the bridge to Corpus Christi. Mavis had a great time learning all about the plants, wild animals, and bugs found in such a rural area. Only the hurricane and tornado stories topped the strange bugs. They thought they had an eight inch long Giant Centipede saved in their freezer but it could not be found. We had not seen Tom and Molly for 10 years back in Nashville, but we were treated like family. With a sister, son and his new wife, we all went out for dinner in Corpus Christi and really enjoyed ourselves. On Monday we left for the Aransas Perry ferry to get to Mustang Island and the State Park where we had a reservation. It was very cold at 34 degrees with a 20 mph wind. I actually walked 0.7 mile in this to get the surf photo here. Needless to say I had the beach to myself. Tuesday we drove to San Antonio, parked downtown to see the Alamo and River Walk. It was still very cold and the restaurant where we had lunch had a hard time heating the place. Mavis had seen the Alamo before so she spent her time in the gift shop where she found the Texas Bug Book with the photo of the giant centipede. I took photos of all the interpretive signs rather than stand around in the cold reading them. I did learn that in the March 6, 1836 battle all but 3 American's were killed by the Mexicans. It was a battle with 1,500 on the Mexican side and and 257 or less on the American side. I counted more soldiers from Tennessee were lost than those from any other state. Hondo is one of the nicest small towns we have seen in our 90,000 miles. It's the center of a farming community and prospering. We stayed at the Quiet Texas RV Park which a real estate agent created out of a former sewage plant. His home is now in an old water tank and he has his own windmill. It was really nice park. 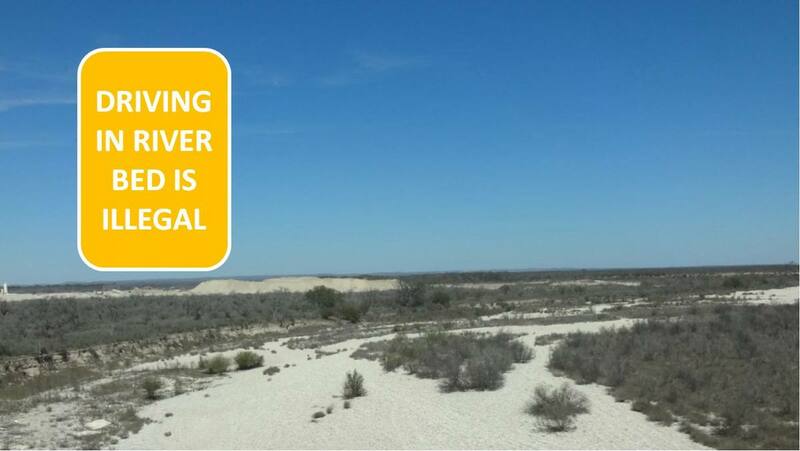 On the drive to Del Rio I was amused by a road sign, "Driving in river beds is illegal". You wouldn't see such a sign on the Tennessee River. However, here the rivers have dried up. The Border Patrol has created dirt roadways alongside the highway that cross the river beds so they can see if anyone is hiding under the bridges. This town is a border crossing into Mexico. The parts we saw were all pretty run down including the campsite we stayed at tonight. The town is on the Rio Grande but you can't get close to seeing the river because of the massive fence that has been built. There was a long line of cars waiting to get back into the USA so we skipped trying to see the Rio Grande.